There are certainly positives to getting multiple Pierateers together to review the same pie. In addition to the opportunity to discuss Pierate strategic objectives and have a bit of banter it does perhaps give a more accurate review by taking account of the opinions of more than one person. There are also downsides, like waiting for Pierateer RAS to finish eating! Seriously, how does he take so long? It is like he is individually reviewing each atom of the pie! But joking aside, it was great to get together back in the Buckinghamshire village of Lane End, the vicinity of which we grew up in. But what pies were we going to review? Quite surprisingly we haven’t actually reviewed the pies from the local butcher – Johnstons. We took a stroll over there on a crisp December morning. The shop is nice, a modern village butchers which also encompasses a Post Office but most importantly they make their own pies! We picked up a slice of hot water crust Game pie and a standard Steak & Ale. No sooner had we got back to the house and Pierateer SJL drops the Game pie on the mud. School boy error! But fortunately being a fairly robust pie the edge could be sliced off still leaving a sizable chunk of pie to be reviewed, it is too the credit of this pie that there was still a good amount left for it to be split three ways between Pierateers RAS, SJL and TJP (and it still took Pierateer RAS half an hour to eat it). For an impromptu visit, with no recommendation, these pies were surprisingly good, with the cold Game Pie standing out enough to achieve 'Pierate Recommended' status. See below for the scores breakdown. Condition – 6.0 out of 7 – Despite being a slice from a bigger pie it held together well, even though it was dropped on the floor before this photo was taken! Colour – 6.0 out of 7 – Just look at that glossy deep brown, marvellous. It was only slightly verging on overdone in places. Capacity – 6.5 out of 7 – Fantastic portion size for the price. 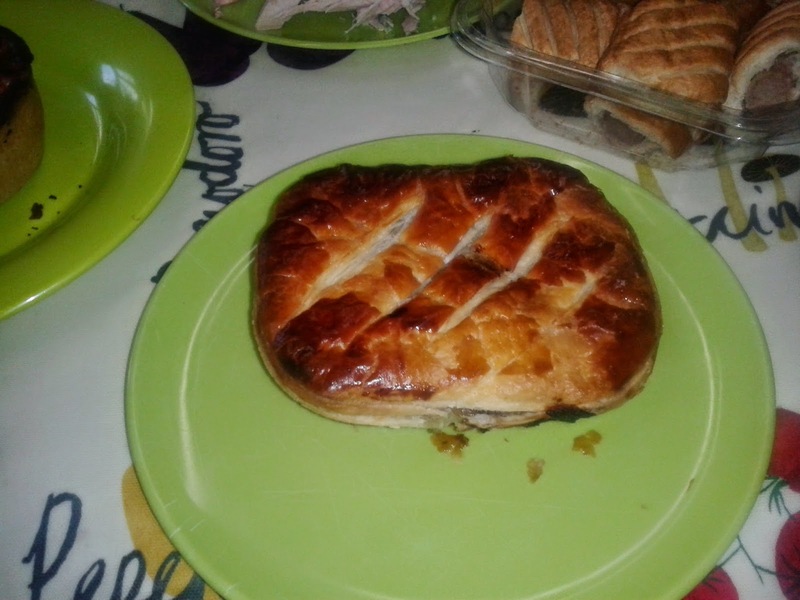 Cheapness – 6.4 out of 7 - £2.30 for a satisfying and meaty pie is great value. 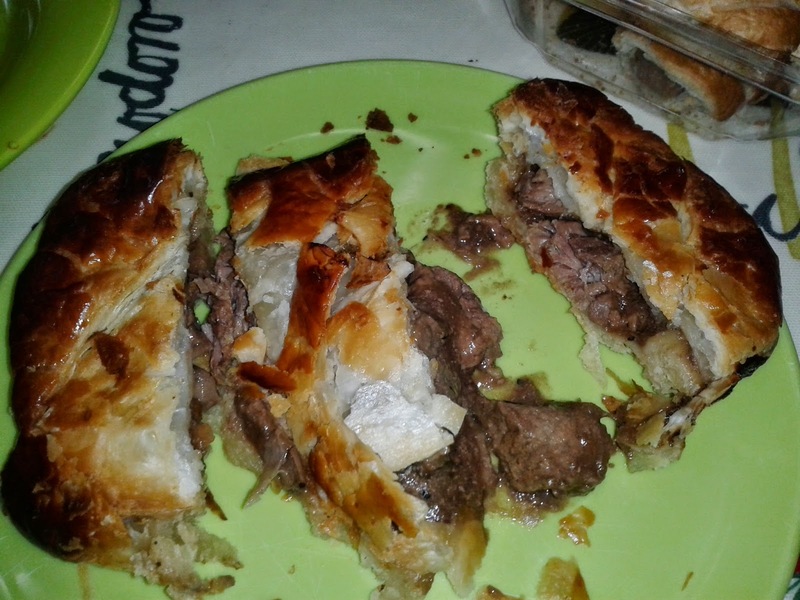 Chewiness – 6.0 out of 7 – The pastry was crunchy on the outside and soft in the middle, Pierateer TJP commented it was up there with some the best hot water crust pastry. The meat wasn’t at all chewy but the jelly could have perhaps been dispersed better throughout the pie to soften it up. Content – 5.3 out of 7 – The content was packed with meat which didn’t disappoint. There was a great taste to this pie, including from the pastry. The pie had been seasoned with stuffing and the Pierateers agreed that it perhaps tasted a bit too much of stuffing which is the main reason it hasn't quite obtained a 'Highly Recommended' status. This didn’t allow the flavours of the game to come through quite enough and made the taste a bit homogenous throughout. Consistency – 5.5 out of 7 – Almost a Highly Recommended, this pie did a lot of things right, it was moist and satisfying. Perhaps would have done better were it a whole pie rather than just a slice (see guide to the ultimate pie). Condition – 5.0 out of 7 – This is not a bad looking pie, despite not doing anything very special. It was scored on top to denote the flavour. Colour – 5.4 out of 7 – If we ignore the slightly over done lid (second school boy error from Pierateer SJL) then we wouldn’t want to gloss over the fact that this pie was a delightful glossy brown. Capacity – 4.4 out of 7 – Mixed views from the Pierateers, probably depending on which section of the pie they were eating. Some parts were well filled but there is no getting away from the fact that this pie was of the shallow, oval-shaped variety where the pie significantly narrows towards the base. There wasn’t much airgap apparent but the pie did squish somewhat on slicing. Cheapness – 3.9 out of 7 - At £2.35 this was slightly more expensive and also perhaps less satisfying than the Game pie. Given that there wasn’t a busting lot of meat and it wasn’t a particularly big pie, it could have been better value. Chewiness – 5.4 out of 7 – Mostly nice big chunks of soft meat. The pastry was gooey and crispy in the right proportions, which slipped down well. The puff pastry went down particularly well with puff-lover Pierateer RAS. Content – 4.5 out of 7 – This was a strange one, sold as steak and ale, both TJP and SJL thought they could detect some hint of kidney, was it mis-sold? Either way, it didn’t taste bad, in fact it was quite good. A nice meaty sauce which was thick enough to get featured on the Jeremy Kyle show. However, it didn’t soar and hit any high notes with TJP commenting it was hard to find anything interesting to say. 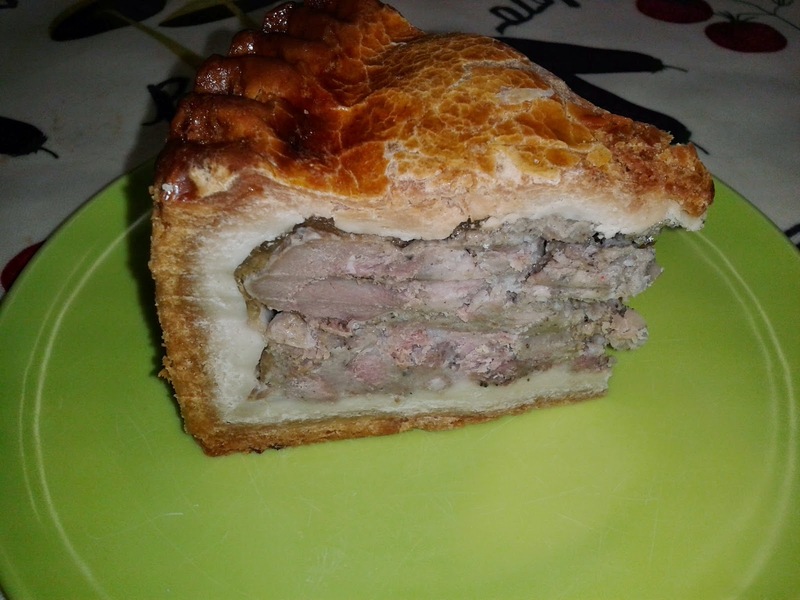 Consistency – 4.5 out of 7 – This pie worked well as a package but it wasn’t consistently good with some Pierateers feeling their third was a little lacking in meat. Not special enough to buy again at the price but it did taste good. It is a shame to note that Kelly's Kitchen (who we previously reviewed) seems to be no more but it is good to see that this does not mean the end of Lane End pies with a good couple of performers from Johnstons.